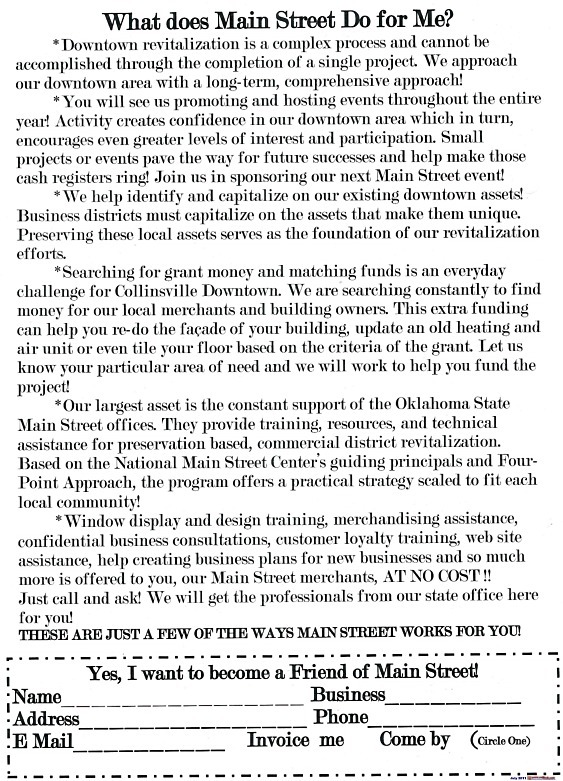 Collinsville's Main Street Program started in 2000 and is associated with the Oklahoma Main Street Program and the Department of Commerce. Ø Organization involves getting everyone working toward the same goal and assembling the appropriate human and financial resources to implement and sustain the revitalization program. A governing board and standing committees make up the organizational structure of the volunteer-driven program. Volunteers are coordinated and supported by a paid Program Director. Ø Promotion increases the social values of downtown encouraging consumers and investors to live, work, shop, play and invest in the Main Street District. Marketing the districts unique characteristics with an affective promotional strategy forges a positive image through advertising, retail promotion, special events, and marketing campaigns. Ø Design increases the economic value of downtown through rehabilitation construction and the design of public spaces that will attract more people to work, walk and gather on a regular basis. An inviting atmosphere, created through attractive window displays, parking areas, building improvements and streetscapes with landscaping conveys a positive visual message about the commercial district and what it has to offer. Design activities include instilling good maintenance practices, developing sensitive design management systems and long-term planning. Ø Economic Restructuring increases the economic value of downtown by strengthening the existing economic assets while expanding and diversifying its economic base. The Main Street Program helps sharpen the competitiveness of existing businesses and economic uses to build a commercial district that responds to today's consumer needs. Ø Comprehensive- an ongoing series of initiatives that build community support and creates lasting progress. Ø Incremental small projects make a big difference by honing the skills and confidence of participants and demonstrating to on-lookers that positive things are happening downtown. Ø Local Commitment -although the Main Street Program can provide valuable assistance, local leadership and community involvement and commitment creates long-term success. Ø Public/Private Partnership establishes meaningful, long-term revitalization. Both the public and private sectors of the community must be involved and committed for a local Main Street Program to succeed. Each sector has an important role to fulfill, and each must understand the other's needs, strengths, and limitations so that an effective partnership can be created. Ø Existing Assets identify and capitalize in the downtowns unique assets. a viable center of commercial and civic activity while incorporating it into their regular routines. change. Dramatic, incremental improvements remind the community and shareholders that revitalization is working. Organization Recruit members, volunteers and donations for this volunteer driven program. Promotion Forge a positive image by advertising, promotion, marketing and special events. Design Get Main Street in top physical shape by capitalizing on its best assets. Economic Restructuring Help existing businesses expand and recruit new ones. 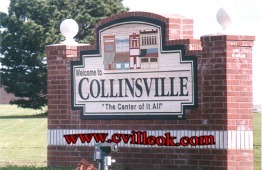 Move up to Collinsville! A City with a friendly, relaxed and orderly environment where our environment and historic image is preserved and planned economic growth is encouraged. Check Back Later For More Downtown Collinsville Block Indexes created by Ted Wright in 2006 for www.cvilleok.com ... which capture a time slice of the evolving businesses and buildings here.